The mission of Puppy Prodigies is to provide unique initiatives that utilize service, therapy and emotional support dogs in an effort to empower people with disabilities, kids with special needs, wounded warriors and veterans with PTSD. We build the foundation for future teamwork by positively strengthening the human-animal bond which allows for profound paws-on healing interventions. Our values are deeply rooted in the quest to facilitate lifelong bonds between people and dogs. The mission of our SURFice dog initiative is for our dog ambassador, Ricochet to achieve her highest paw'tential by serving in the role of a SURFice dog and assistive aid for people with disabilities, kids with special needs, wounded warriors and veterans with PTSD. The objective is that she act as an ambassador and live a lifestyle of helping others by pawing it forward while raising awareness and funds for human/animal causes. ​Additional information on this initiative can be found on our SURFice dog initiative page. ​My name is Judy, and I'm the founder of Puppy Prodigies. I've been hanging out with, and training animals since I was a young girl. I remember, when I was about 8 years old, teaching my first golden retriever to jump through a "hoop", which was actually an old bicycle tire (see picture below). About this same time, a dear friend of our family's found out that her son was hearing impaired. I marched over to their house holding my dog's leash with one hand, and my jar of pennies with the other... determined to make a difference. I left the jar with them that day in hopes they could buy a hearing aid, but in retrospect, I should've left the dog! Shortly after that, I was diagnosed with juvenile rheumatoid arthritis and due to the pain and degenerative nature of my diagnosis, I wasn't able to partake in many of the extra curricular activities that my friends did. So, I put my young heart and energy into charitable causes, finding great fulfillment and realizing I could do more than just save pennies! In addition to Puppy Prodigies, I volunteer for Pawsitive Teams with my own dogs as part of their goal directed therapy program working with children and veterans with PTSD. I also have a "change of career" dog from Puppy Prodigies name Ricochet. 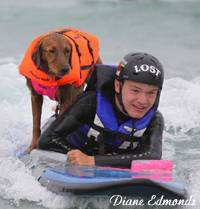 She is now a SURFice dog who raises funds & awareness for human/animal causes as part of Puppy Prodigies. You can learn more about her at www.surfdogricochet.com. I have a bachelor's degree and my previous corporate life included a career in healthcare administration/business development. I've also received certificates from San Francisco's Hearing Dog Program and the Marin Humane Society's Canine Behavior Academy. I held a certified professional dog trainer title, and know the value of education. I stay current on the latest training techniques, and attend many seminars each year taught by some top professionals in the field of dog training. I stay abreast on the research of puppy development, which includes interaction with animal behavior researchers so I can make adaptations to the program as necessary. The philosophy behind Puppy Prodigies is very simple… we're passionate about puppy development. Education and training builds futures and we believe it's a great way to start a young puppy on his journey. We specialize in providing puppies with early interventional learning opportunities and environmental influences at critical stages of development. We also provide education and resources that facilitate early learning which helps puppies prepare for life long success. By doing this, we positively affect behavioral tendencies which will ultimately enhance their life, as well as their human counterpart’s. Our program is designed to provide puppies with a long-term advantage at an early age in an effort to effect adult behavior tendencies. In addition, our initiatives can be used for puppies born at a shelter, or rescued from a dire situation to help counter-balance their negative experiences. This program can also help reduce the number of pet dogs that are relinquished to animal shelters for behavior related problems. Our program works for any puppy, whether in training to be a service dog, rescued puppies, or litter births at shelters. ​Our early learning program is based on concepts derived from animal behaviorists, researchers, and experts in the field. We also incorporate our practical experience in dog training, assistance dog training, and puppy rearing. Our program integrates early learning and selection screening to identify puppies who display the potential for assistance work. When puppies are 49 days they can be temperament tested, and matched according to future endeavors, or pet home. Our approach is multi-faceted as we provide a comprehensive early learning and intervention program which is the first step to a puppy's training journey. We focus on critical stages of development starting at birth by providing the puppy with structured exercises and experiences such as early stimulation, conditioning, imprinting, habituation, socialization, environment enrichment, and training. This early intervention prepares the puppy for their future roles, and promotes more successful outcomes. The purpose of our early learning program is to condition the puppies so they learn to learn! Visit our Early Learning Program page for details. We DO NOT believe anyone should "breed just to breed". If you cannot dedicate 2 months of your life, 24/7 to the puppies, we don't believe you should be breeding. But, we know there are people out there doing it, so we hope this program will at least help the puppies that are brought into the world... we owe it to them! We provide support to assistance dog organizations, rescues, and shelters to incorporate the early learning that is fostered at Puppy Prodigies. It can be built upon throughout the puppy's training journey. Behavior never remains the same – it’s always changing. If a puppy isn't the right fit for a service dog role after advanced training, we encourage programs to focus on their strengths in an effort to find a role in which they can still do something meaningful with their lives, or be the best dog they can be. 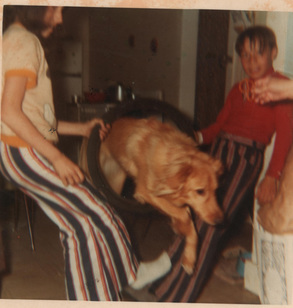 Me (on the left) at 8 years old teaching my dog to "jump through a hoop" which was actually an old bicycle tire. My cat Bailey, also jumping through a hoop! 4 1/2 week old puppy learning to "target"
4 1/2 week old puppy learning to "tug"
​"They've taught me more than I could ever teach them"